oh, hyped products. they’re fantastic when they work but there’s a slightly deeper level of disappointment when they don’t. now, we all want smooth perfect looking skin, with no blemishes and reduced pores. well, i know i definitely do. my skin has never been ideal. it’s always had a blemish or two, it’s never been totally even in tone and i don’t think i’ve ever looked in the mirror and been truly content with my skin. which, at the age of 22, is starting to get on my nerves. la roche-posay effaclar k: is a daily renewal fluid which gradually exfoliates the skin texture to reduce pores and regain a smooth and clear complexion. 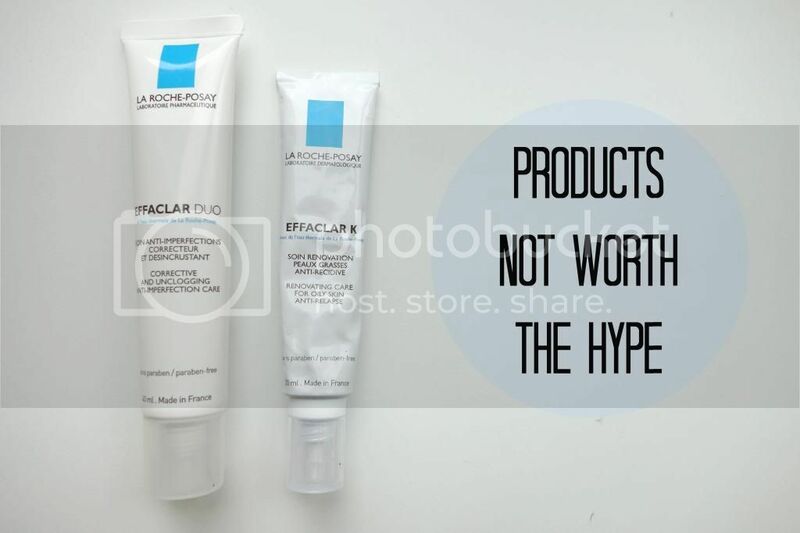 la roche-posay effaclar duo: is a corrective, unclogging and anti-imperfection product which reduces the appearance of imperfections and purifies pores. what i thought: i’m going to lump two reviews in one as they both had the same effect on my skin. i tried the products for around 14 days each, which for a product that i use every single day i feel is ample time. i can usually tell if i like a product or not after about 5-7 uses and i wish i had listened to my gut instinct, but i thought i’d power on after the first few warning signs. after the first week i noticed my skin looked really congested, especially down the sides of my nose and cheeks. but, as i was a little bit stressed at the time, i thought it might just be one of those things. then the breakout started. over the next day or so i ended up with many really sore, under the skin blemishes on my chin, cheeks and near my nose. i only ever get these from products and, as i wasn’t trying out anything else new, it had to be from the effaclars. i know a lot of people have said it gets worse before it gets better but, after reading caroline hirons (aka god)’s blog stating the purging stage is a myth, i made the decision to stop using the products. by the end of two weeks my skin had never looked worse. i resembled a hormonal teenager with angry bumps on my face and it made me feel like utter rubbish. the only thing that gets it back on track is my beloved liz earle cleanse and polish, which i could rave about all day long, and using a lot of clay based calming masks to reduce the congestion. have you tried either of these products? do they work for you? please let me know! ps. check out the lovely gemma’s blog for some great beauty reviews! and don’t forget to enter my models own giveaway here. **disclaimer: the lovely escentual sent me effaclar duo to try as they saw me complaining that k broke me out, which was so kind of them and i wish i could have wrote a more positive review! anyways, they have 1/3 off french skincare at the moment, so make sure to check them out! check out my sponsors for this month: love your shoes, who stock some amazing affordable shoes // ohellabella, which is daniela’s amazing beauty/style blog // pandora’s beauty basket, which is a amazing beauty blog // see it want it own it, who stock the sweetest jewellery and accessories // and trina wears, which is a fantastic personal style blog!